Vitamin C, vitamin D, and calcium, these are nutrients whose importance is stressed on a regular basis. However, magnesium is a mineral that needs to be thought of in similar fashion. Its roles in the body are essential, and a magnesium deficiency can become very dangerous. Nearly 80 percent of Americans are deficient in magnesium, and this needs to be corrected. In this article you’ll learn the importance of magnesium and how to make sure that you get and maintain the proper levels of magnesium. Magnesium is one of those nutrients whose benefits seem to have no boundaries. 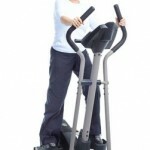 It plays key roles in the nervous and cardiovascular systems. In the nervous system, it helps to maintain the function of the nerves and the muscles, and it also promotes emotional health. It supports a positive mood and feeling of well being by helping with the production of serotonin, and a lack of magnesium can lead to feelings of stress and anxiety. In the cardiovascular system, it helps to keep the heart beating in a healthy manner, and without magnesium the heart tends to beat unsteadily and abnormally. It also supports the digestion of fats, proteins, and carbohydrates, and magnesium is also needed to create adenosine triphosphate (ATP). This is essential to energizing the body. Magnesium also helps with the creation of DNA and RNA. Magnesium works alongside other nutrients in the body, and because of this it is essential to maintain a balance between many of these nutrients. There is a tendency to consume rather large amounts of calcium, while neglecting magnesium levels, and this can be accompanied by negative health consequences. For optimal health it is essential to maintain a healthy balance between calcium and magnesium. This tends to happen frequently in women that are looking to fight off osteoporosis during menopause, and, despite the fact that many consume plenty of calcium, osteoporosis is still on the rise. Large amounts of calcium in the body that aren’t balanced by magnesium can also harm the heart. When calcium levels are too high and magnesium too low it can increase the risk of heart attack and sudden death. It is generally believed that the body needs two times as much calcium as magnesium, and many of the formulations of minerals supplements reflect this belief. This just isn’t true, and in fact the real ratio consumed should be one to one. Keeping a balance with vitamins D and K2 is also important. There are some concerns that excessive amounts of vitamin D can actually lead to a magnesium deficiency by overworking magnesium within the body. Vitamin K2, kind of like magnesium, also helps to keep calcium balanced. It helps the body to properly utilize the calcium that is provided, and if there isn’t enough K2, calcium can gather in the wrong places. Calcium, vitamin D, vitamin K2, and magnesium all work together, so it is essential to make sure that the body has the proper levels of each. Due to the fact that very little of the magnesium in the body can be found in the blood, it is very difficult to test for deficiencies. One of the best ways to determine a magnesium deficiency is to pay close attention to any symptoms. Symptoms of a magnesium deficiency are both mental and physical. One of the most common symptoms is muscle spasms and cramping. That’s why a lot of natural muscle relaxers have magnesium as one of their ingredients. This shows the importance of the magnesium to the muscles and nerves, and emotionally one may notice an increase in stress or anxiety when there is a lack of magnesium. Symptoms can also include changes in personality, numbness, coronary spasms, twitching, tingling, and abnormal heart beats. If these symptoms are experienced it is important to supply the body with magnesium. One of the reasons why magnesium deficiencies have become so common is because it is very difficult to get magnesium through diet alone. Traditionally magnesium could be consumed through food grown in mineral rich soil, but modern day agriculture has depleted the soil of many important minerals, including magnesium. Some foods that can provide the body with magnesium are natural and organic leafy greens, nuts, beans, seeds, avocados. Many of the chemicals used for agriculture also hinder the absorption of magnesium. Magnesium Aspartate is a great type for those looking to address a deficiency. 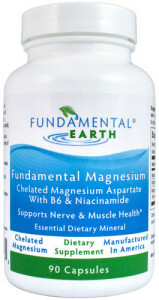 This form of magnesium (as found in Fundamental Magnesium) is a chelated form and highly bioavailable. It is easy for the body to absorb. Magnesium Chloride has a relatively low percentage of magnesium (12 percent), but it is better for absorption. Magnesium Oxide is approximately 60 percent magnesium, and it is a non chelated form. The magnesium is bound to either a fatty acid or an organic acid, and magnesium oxide may also act as a stool softener. Magnesium Sulfate and Magnesium Hydroxide are frequently used as a laxative. These are potent forms and it can be easy to take too much. Their use should be monitored closely. Magnesium Carbonate is 45 percent magnesium, and it may also act as an antacid. Magnesium Citrate provides magnesium bound to citric acid, and it may also act as a laxative. Magnesium Taurate is magnesium mixed with the amino acid taurine. This form of magnesium may be particularly helpful to those experiencing the emotional side effects of magnesium deficiency, because it has a calming effect. Magnesium Threonate is an emerging form of magnesium that is growing in popularity due to its ability to penetrate the mitochondrial membrane. The forms of magnesium vary, and other health benefits can be taken advantage of depending on the form that is consumed. What Can Negatively Affect Magnesium Levels? When trying to maintain healthy levels of magnesium it is important to recognize factors that could deplete it. As previously stated, nutrient balance plays a key role, and avoiding fluoride and prescription drugs can also help to maintain the proper magnesium levels. Many different prescription drugs can lower magnesium levels in the body, and because of this they can actually exacerbate a number of health conditions that are associated with low magnesium. Some prescription drugs also promote inflammation, which can further deplete magnesium. Fluoride can be found in a number of different things, and it binds to magnesium and causes a drop in its levels. 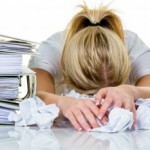 Stress should also be avoided, which can be difficult in today’s world. Magnesium can help the body to fight stress, so when chronic stress persists it can lead to low magnesium levels. It’s time to stop overlooking magnesium, don’t you think? Magnesium plays important digestive, nervous, and cardiovascular roles, and a deficiency can lead to a number of health problems. For many magnesium supplements are essential, and you should find one that suits your needs. And, of course, be sure to maintain a healthy balance between vitamins D and K, calcium, and magnesium.